As I mentioned in the last sentence of my Pork Daube post, the leftovers are delicious. We ate it for a day or two afterwards, simply reheated, but with the gelatin rich sauce that this stew has, I wanted to try something else. I separated the solids from the cooking liquid and chopped everything coarsely. I reduced the cooking liquid a bit more, tossed it back with the chopped solids and added a bit more seasoning. Since this will be served cold, a bit more salt is a good idea. 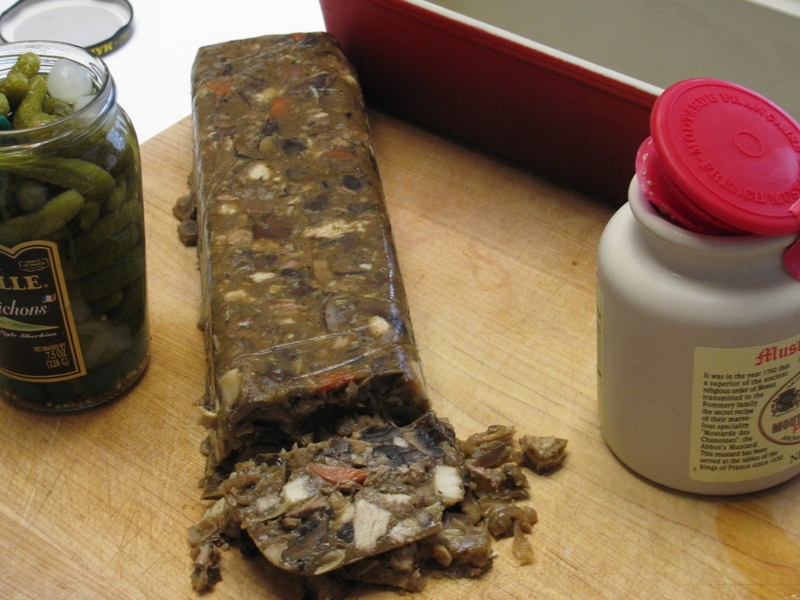 I packed it in a terrine and refrigerated it till it gelled solid. Served with cornichons and good Pomery mustard this is elegant and delicious. Since I did not mince everything, the terrine did not slice perfectly, but I love the coarse texture I got by hand chopping.